This bow tie features a unique application of natural, sustainable cork. 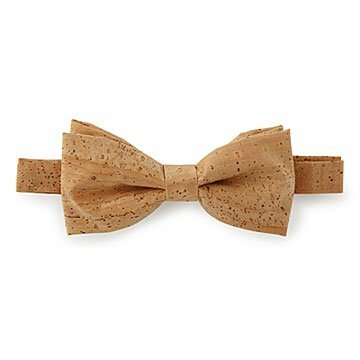 Bring a truly organic touch to your haberdashery with this natural cork bow tie. Incredibly thin and flexible layers of cork adorn this handsome tie, displaying the warm, buff color, organic variations, and inviting softness of natural cork. A sustainable material, the bark of the cork oak regenerates within 7-9 years after harvest, and the process extends the life of the trees to over 200 years. This unique tie makes an equally distinctive statement paired with jeans or tux, or a go-to gift for the "guy who has everything." Handmade in Portugal. Bow measures: 4" L x 2" W: Circumference extendable: fits neck size 14" to 19"
Clean with wet towel and non-toxic soap like baby shampoo or Ivory soap. Let air dry. My nephew is 20 years old and has taken to wearing bow ties to work every day. He loves unique ties and you can't get more unique than this. It's so nice to see a young man take pride in the way he looks. This is one of those gifts that are so unique you wouldn't think a tie could be made out of cork. Different, fun and definitely a conversational piece. He loves it, says everyone wants to get closer and feel it. Great for a wedding party, beach party, for wine lovers, vineyard wedding or event. I ordered this as a Christmas gift for a friend in CA who's very hard to shop for (he's a photographer/interior decorator). It was sent back because no one could sign for it. I asked the company to send it again. Uncommon Goods was so awesome to resend it (free of charge). I didn't know he sold his condo & moved to a different address (he's a frequent traveler). Fast forward 4 months later, I called UG to see if they can send it to my friend's new address and they did. Again, free of charge. My friend finally got his present in April. He loves it so much. Uncommon Goods has the best customer service ever. I swear. Cute little lightweight bow tie in a novel material. The portion that goes around the neck is a little wrinkly and the back of the bow has a very obvious glue seam. I like the design but would likely purchase the wooden bow tie available on this site given another chance. My boyfriend has the most extensive collection of unique bowties I've ever seen. He loved this and had never seen anything like it:). The bow tie is pre-tied for obvious reasons -- I don't know how you'd tie cork -- and I know some bow tie hard-liners don't like pre-tied. However, I'm pleased with this unique gift. What fun for my bow tie-loving nephew!